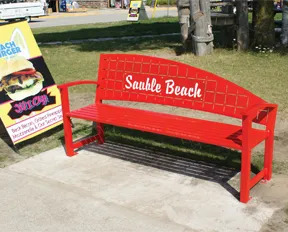 Paris Site Furnishings can manufacture custom benches to complement any décor or environment, boosting awareness and branding. Precision Laser Cutting allows accurate reproduction of customer-supplied graphics, logos and other imagery for a unique solution. This is an ideal way to create seating that is as unique as the facility it is promoting, while enhancing name recognition. Available as one-off projects or in combination with other site furnishings, these unique amenities help a wash business stand out from the crowd. All Paris Site Furnishings custom laser cut products are manufactured in Princeton, ON and available factory direct or through distributors and dealers throughout North America.